“Tiered seating supported on a dedicated structural system and two or more rows high (see Grandstands). As we mentioned in our previous post, New Year, New Budget Planning: Telescopic Bleachers, start with an inspection and do your research. 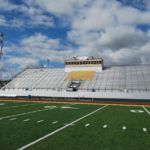 If you know for a fact that you want to demo your existing bleachers, maybe an inspection isn’t necessary – but there may be options that you’re unaware of that may point you toward a renovation rather than a full replacement. If your aluminum planks are good, but your understructure needs to be replaced, there are options that may reduce costs for you. And if your understructure is solid but you want new seating – that is an option too. Ultimately, make sure that you and/or your consultant/contractor fully understand what it means to be code compliant, especially upgrades. We’ll go into this more next week with Renovation Options. Do Your Research: What’s on Your Wish List? Know what you like and don’t like about your current seating and seating in other districts. Evaluate your major concerns with your current seating. Know what is possible in the space you have available. Know what extras you are willing to invest in either now or down the road. Have a clear understanding of what it will take to maintain your new seating. This is everything from VIP Seating, Student Sections, Press Boxes, and access to the understructure. Maybe a neighboring district has riser boards that match their district color pallet that you like or perhaps another district has a Press Box that is too large or too small. Take some time to do some inventory. What creature comforts do you want to make sure are available for the community? Backrests/VIP seating is a great way to offset the costs of new bleachers, an annual fee for VIPS could go toward preventative maintenance plans lessening the financial burden. What is your Why? Why are you investing at this time? Are you outgrowing your current seating unit? Are your current bleachers unsafe for patrons? Take all of this into consideration to course correct for the next installation. Maybe you have a hillside bleacher that will make design and installation a bit more complex or perhaps you’ve outgrown your current seating and need to make room for additional seats. Make sure to talk to the experts that can explain what is required of your space – and what is possible to get you exactly what you want. Are you wanting to add a Press Box down the road? Or maybe you want to add VIPS seating in lots of 10 at a time to reduce costs up front – whatever it is that you want down the road, be sure to include it in your initial plans so that when the time comes, you’re not losing seats or having to make a tremendous amount of upgrades to get you what you want. Did you know that according to the Ohio Building Code, the ICC-300, and Manufacturer’s standards you are required to have an annual inspection. But don’t stop at checking the task off the list, make sure you are looking at your report, a good report will have specific action items needed to maintain your bleachers. Keep in mind too that with the change in weather – aluminum contracts and expands which means you’ll need to check hardware and structural supports throughout the year, not just during inspections. 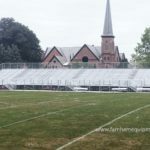 As soon as you start to “think” you want to invest in outdoor bleachers, talk with an expert to make sure you are aware of delivery and installation times. This time of year gets heavy with RFPs and orders and the summer time slots fill fast for installation so the sooner you are aware of what you need, the sooner you’ll have a realistic understanding of what is possible for a completion date. Want to talk outdoor bleacher options?